Peter Blake was a pioneer of pop art in Britain. In this self-portrait, the artist represents his fascination with American and popular culture. Blake is holding an Elvis Presley fanzine and wears baseball boots, fashionably turned-up wide-legged Levi jeans, and a denim jacket covered with an array of badges. As well as the obvious ‘stars and stripes’ on the jacket pocket, other badges have American associations, such as Pepsi-Cola. At the time, Blake was yet to visit the United States and his choice of a suburban, vaguely British garden setting locates him as a distant consumer of its trends. Collect examples of pop art from Britain. Compare these to examples from the United States and Australia. What are the similarities and differences? Analyse the visual language Blake has used in Self-portrait with badges to convey meaning. Think about the subject matter, composition and painting technique. What does this work tell us about the artist and his influences? How could you appropriate this image to create a self-portrait? What would you include to make it your own? Create an artwork and write an extended label to accompany it in a class exhibition. In 1966, Time magazine famously described London as the ‘Swinging City’: a thriving hub of optimism and innovation, bolstered in part by pop art’s boldness and rebellious spirit. The new pop style announced its arrival at the Young contemporaries exhibition in 1961. This annual showcase of emerging talent profiled young artists from London’s Royal College of Art, including Derek Boshier, Peter Phillips and David Hockney. They found their subjects in city life, which was rapidly evolving in the wake of renewed economic prosperity. 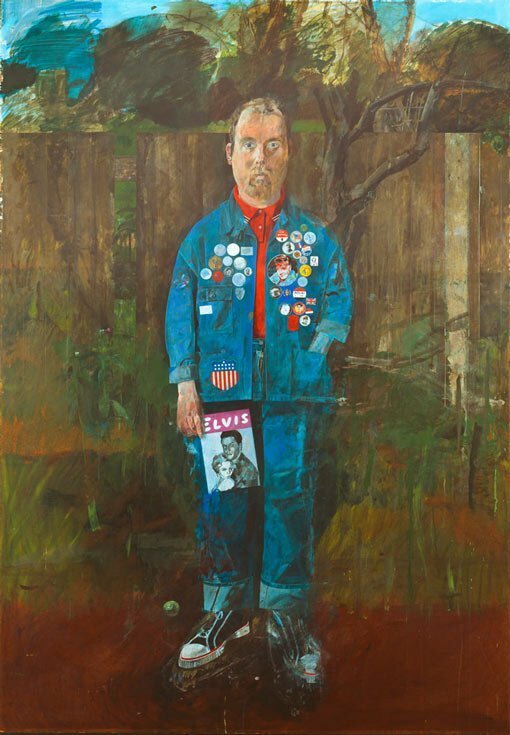 British pop art of the early 1960s often included both American and local references, such as Peter Blake’s self-portrait as an Elvis fan in an English garden. The artists maintained a painterly style, combined aspects of abstract and figurative art and brought together diverse visual elements in a style that often mimicked collage. Their work became part of the so-called ‘British invasion’ of fresh music, fashion and culture that swept around the world. British pop influenced Australian artists during this period; at the same time, many Australians who moved to London in the 1960s – such as Robert Hughes, Germaine Greer, Barry Humphries, Richard Neville and Martin Sharp – also played a part in shaping the London scene.